If the park were a fresh, doughy roll, then the Line Women's Honey Bee Ski would the sweetest glaze to smear all over those rails and jumps; just don't forget to butter before you take off. The early rise tip and tail encourage buttering all over the park, and also work to provide you with enjoyable float in deeper snow while still maintaining easy engagement on hardpack. 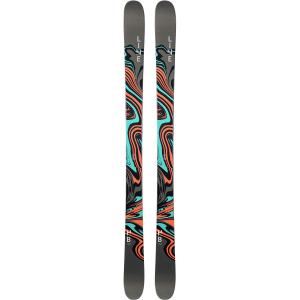 Line's Symmetrical Flex provides an equally balanced feel whether you're riding switch or not, and the lightweight aspen wood core keeps the ride soft, playful, and responsive, also makes the ski easy to throw around. Fiberglass near the core along with thicker edges and bases add durability to the mix, increasing the tuning life so you can spend more time perfecting your 360 and less time in the shop.